So I know you know better than to head out to walk, run, bike, or skate without bringing your ID (right?). If, however, you’re still puzzling over how to carry it in the tiny key holder that passes for a pocket in your workout capris, allow me to make a suggestion: The next $30 you have available, spend it on Road ID’s new Wrist ID Elite. 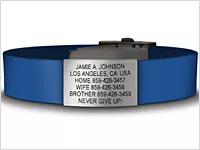 The idea behind this handy accessory (which also comes in shoe, ankle, and dogtag-style versions) is simple, but brilliant: Your name, address, phone number, emergency contacts, etc. (I also have my blood type on mine) are etched onto a tag mounted on an adjustable rubberized (read: comfy) band that you fasten around your wrist like a watch. If you’re so inclined, you can opt for the interactive version, which lets you create an online profile with your medical and insurance information; instructions on how to access the info in an emergency are printed on the back of the tag. I bought my first Road ID several years ago (a slightly less comfortable wrist version that fastened with Velcro, but still did the trick) after a friend of a friend was hit by a car while out for a solo bike ride. It dawned on me that if something were to ever happen to me while I was out on the road, whoever found me would have no way of knowing who I was, how to contact my husband, or how to access medical information that could save my life. Talk about a sobering thought. I’ve since purchased Road IDs as birthday gifts for several friends, and am planning to get one for my husband for Father’s Day. (Ignore that last bit if you’re reading this, honey.) An odd gift choice? Perhaps. But hey, can you think of a better (totally unschmaltzy) way to say, “I care about you”? Pros: It’s the simplest, most effective way I’ve found to keep important ID information on hand during outdoor workouts. Extra tip: When trimming the band to the right length, cut only a little bit at a time so you don’t lop off too much (trust me on this).